On this day last year - 23rd March 2018, the great community @wafrica was founded. Happy one year anniversary to @wafrica and to everyone who has been part of the community. I want to specially thank the founder - @surfyogi, for the love and concern he has for the Africa community. He has impacted us all and I pray God will continue to bless you and make you a source of blessing to others. Kudos to the @wafrica curators, you guys have worked so hard to make the community successful. To all sponsors and community members, I say congratulations to us. To celebrate the one year anniversary, WAFRO tokens have been distributed to all who have participated/contributed to the community in the past one year. You can use Steempeak wallet on all devices, or Keychain for Steem (PC/Mac) to view your WAFRO token balance. 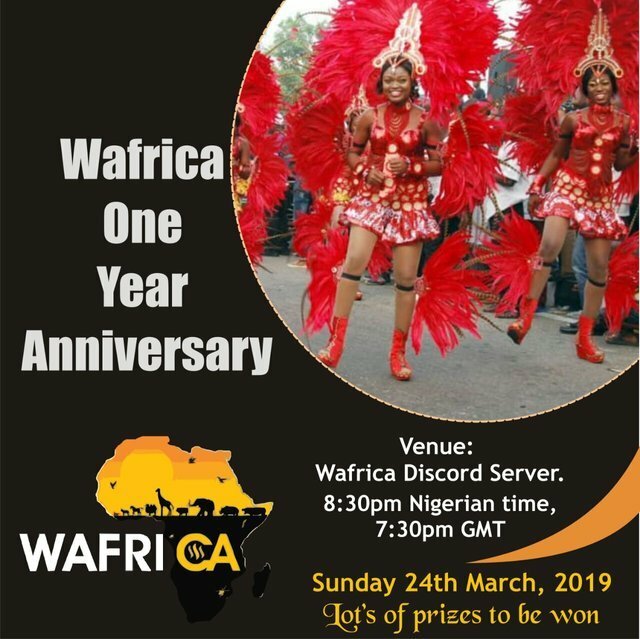 The anniversary party to celebrate the one year anniversary will hold on Sunday 24th March, 2019 By 7:30pm GMT/ 8:30pm Nigerian time. You are all invited to the party, it's going to be fun. Also invite your friends and loved ones, there are lots of prizes to be won. Wow! happy birthday @wafrica . I am lucky to be a part of this community. You just got a 0.87% upvote from SteemPlus!